This morning, I dragged a ladder out into the garden, in the hopes that I would be able to get a look inside Henrietta Hummingbird's nest from a distance. Alas, the ladder is not tall enough. We have a taller ladder, but then arises another complication--the patio cover blocks any view into the nest. It seems Henrietta chose a pretty good location. Of course, I stayed a decent distance from her and used my zoom lens. She seems remarkably laid-back about having us in the yard, but I don't want to push her, or make her feel threatened. While I was on the ladder, I realized it gave me a new perspective on Mom's garden, so I snapped a few shots of her flowers, too. While I was up there, I spotted this bird on Mom's raised bed. Looking straight out at these trees. Eventually I climbed down and took some close-up shots. I moved the ladder to another location and took a few more pictures. with the horse on it. Is there anything quite so satisfying as watching the milk blend into a freshly-brewed cup of tea? Today marked the first day I've had both the weather and the time to sit on the patio with a book, so out I shuffled in my comfies, dragging a book, lunch, some tea, and a blanket (it's not cold, but I like to wrap up) for some good, hard, relaxin'. I ran this morning, spent a good hour running around the kitchen prepping food for the week, and I was ready to dig into my book and enjoy Mom's gorgeous garden. I had been out there a little while when a hummingbird started buzzing around the patio area, which isn't unheard of in our yard--there's a feeder hanging from the patio cover, and Mom's flowers are very attractive to all manner of pollen-eating creatures. I was enjoying my book and idly looking up from time to time, when suddenly, the bird in question landed on top of one of the wind chimes and settled in. Sure enough, under her feathered bottom was a tiny nest, and she perched on it, perfectly still, gently swaying in the breeze with the wind chime. Of course, I don't want to disturb her or make her feel threatened, so I walked around in a big arc to keep a respectful distance. My eyes were not deceiving me. She is, indeed, a nesting hummingbird, and she has chosen a wind chime in our back yard as her place to hatch her eggs. Without dragging a ladder out, there's no good way of knowing if she's already laid eggs--it does appear she's still building, as she would sit for a while, then fly away and return with materials in her mouth every once in a while. But mostly she rests up there, sitting very still and not seeming to mind the big, lumbering human on the patio furniture about ten feet away. I grabbed my camera and took a few pictures using the zoom lens. I love hummingbirds, and I'm fascinated by this nest. No doubt I'll be poking out there every day or two to see what she's up to--but of course I won't get too close. I really do want to leave her be. In the meantime, I'm referring to her as Henrietta, and I looked up enough information to know that female hummingbirds take on all nesting duties, so, while Dad and I were thinking we might have Henrietta and Humbert, it turns out Humbert is off doing his own thing. I've been waiting for it to happen. The first ding on a new car is always the most painful, and even though this one was an easily-fixed ding to the windshield (and not the body), it was just traumatic enough at the time to leave me, well, a little shaken. On Wednesday, I was driving to work on Interstate 80. I leave early enough to miss the worst of the rush hour traffic, so I was just west of Roseville, going about 60-65, and about four car lengths behind the person in front of me, when I vaguely noticed something flying towards my windshield. "Oh, wait, not a bug." "Oh my GOD, my windshield!!!" Fortunately, it wasn't worse. It was a hard hit, and a loud one. Later in the day, I showed the damage to Matt and even he said just the size of the ding alone indicates it was a good-sized rock. It didn't occur to me until later that I could claim this on my insurance, but I can. The glass repair person is coming out this morning to repair it, and I'm fairly confident this is an easy fix--not a whole new windshield. It's kinda borderline at this point, so my fingers are crossed. Well, better later than never, right? I ran this one on Sunday. It is now Friday. It's been a busy week. So, since the Beat the Blerch Half in November, my running has been half-assed. Part of this is due to post-half "don't wannas" and it's also partly due to El Niño giving us lots of great rainy weekends. This is not to say I haven't been running; I've just been running shorter distances. Two miles here, three miles there. Then I signed up for a 12K (not precisely seven-and-a-half miles, but close enough for jazz), and figured that would get me back out on the pavement. Except...it didn't. Which is how I found myself at a park in Rocklin last Sunday, feeling grumpy and under-prepared for seven-and-a-half miles in one of those supremely annoying misty drizzles. 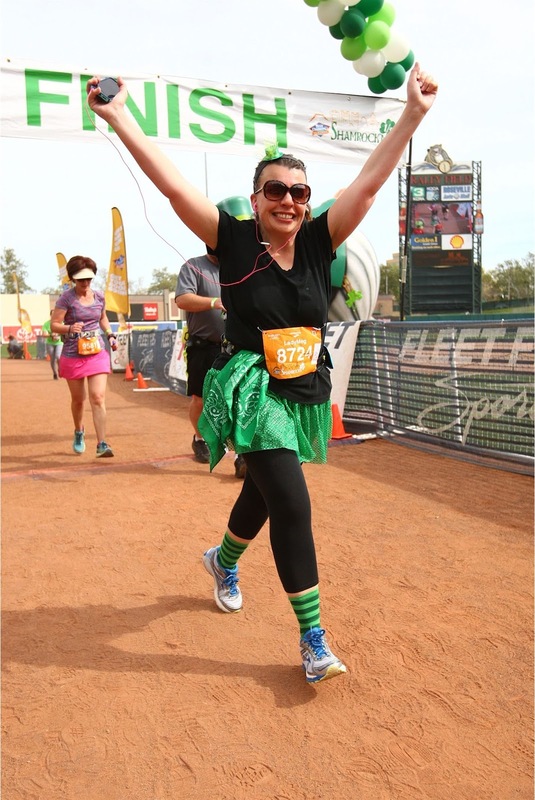 Two weeks before the race, I ran five miles, and one week before, I ran seven. In between these runs...not much. I did my usual strength training with Matt, of course, and I've done some great cardio and other workouts, including a ballet routine that I found recently which is absolute hell on the legs (in a good way). *I love dogs. I hate running with them their owners, because their owners don't have any training whatsoever in how to keep their dog from tripping other race participants. **I didn't have the time or the inclination to walk back to my car. buying a new pair. And yes, those are koalas on my socks. Doing a very deep squat before the race. Fortunately, all of this melted away when I realized that 1) the dogs were all registered for the 5K, and 2) There were minimal tutu-clad walkers lined up in front of me, and I was able to pretty much just do my thing in peace. The race itself was a moderately easy course. Rocklin has some low hills but it's not like my own neighborhood, so I was able to handle it. I did my run-walk method and felt some tightness in my hips here and there, but mostly felt pretty good. I won't go into all the gory details about how the third mile felt like two miles. It was hard to know where "halfway" in this race was, because halfway is somewhere in the neighborhood of 3.75 miles, so I used the four mile marker as my time to celebrate the "Hooray! Downward slide time!!" moment. 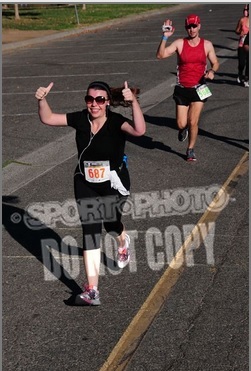 By mile 5 I was in an even better frame of mind. In the last few months of shorter running, I've been missing something. And it's not "the joy of running." I still have that, even when I do "just" two miles on a Wednesday evening, or a quick 5K on a Sunday morning. I've known for ages that it's training for longer races that makes my back hurt. Things get tight, things pull, my hips, hamstrings, quads, etc. etc. all go bananas and before I know it, no amount of foam rolling keeps me from walking funny, and doing that constant hand-to-the-back-grind-my-thumb-in-ohhhh-yeah-right-there thing. I did not miss this. I'm on my feet all day at work, and back pain just doesn't jibe with that. I fully admit that I didn't properly train for this 12K, and even though I actually felt mostly fine after, it's still been Officially Decided (by me) and Officially Agreed With (by Matt) that it's totally okay to just lay off the longer running for a while. Not forever, just for a while. I want to work on my speed again, and spend less time making love to the foam roller. I'm gearing up to find some 5Ks to run, and I've already signed up for the Fab 40's 5K in July, one I've run a few times now and really enjoy. Still, hanging on to the 12K medal, 'cause PRIDE. 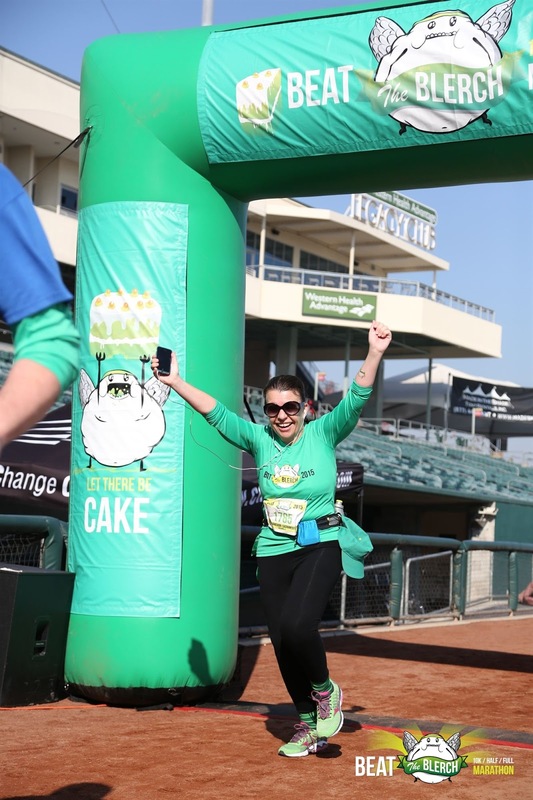 As for Run Rocklin, I came in with a time of 1:36:18, a respectable enough time, and I finished smiling, so there's that. So here's to shifting my goals back to the shorter distances and faster times. I think I've proven to myself that I can do amazing things--two years ago, one half wasn't on my radar just yet, let alone three. Three! A few weeks ago, Facebook let me know that one of my very favorite authors, Julia Quinn, would be at a book store in Santa Rosa on April 1st. "Her only Northern California appearance this year!" it said. I looked at my calendar--a Friday! I did the math in my head. Leaving from work in Sacramento, I could easily make it to Santa Rosa by 5:30, have some dinner, and be at the event well before its starting time of 7:00. Because it was an evening event, and Santa Rosa has other things that make me very happy (hint: a very famous cartoon Beagle and a round-headed kid are very celebrated there), I went all-in and booked a hotel room for one night. If I'm going to be in Santa Rosa, there's no way I'm ignoring the Charles Schulz Museum. Of course, I was there last June, but the museum is very good about rotating its downstairs exhibits. It's not a huge museum, but it's an incredibly loving tribute to the genius of Schulz...and I was delighted to learn that instead of missing it, I was just in time to see one of the best exhibits (in my opinion) they've done: Snoopy and the Red Baron. But I'm getting ahead of myself. Let's go back to the first reason I planned this little adventure. King-sized bed. Do you know how tiny I was in that thing? My view out the window. All the windows have flower boxes. I wandered the immediate area looking for dinner, but found nothing that pleased me. I did, however, say hello to some favorites. I love this statue. I love that Santa Rosa loves Schulz. I decided it would be best to get over to the book store, Copperfield's. It was about three miles away in a large shopping center, where I found a duck sign, the shop itself (marvelous independent bookstore, may it never perish), and a burrito place waiting for me with an enormous, delicious, rice and bean burrito to soothe a hungry teacher's soul. I arrived back at the book store about twenty minutes before Julia was to get started. There was already a small crowd gathered, but I managed to snag a chair in the front. And then, precisely at 7:00, I turned around and she was walking in, with a big smile on her face, and we were all tittering happily at her. I've followed Julia on Facebook for a while now, and she is always very gracious and engaging with fans. I'm delighted to say that in person, she's just the same--funny, sweet, and very, very interesting. This is a Harvard grad who started med school before deciding she really just wanted to write novels. The whole hour was really just a fan Q&A, as she hates preparing speeches and prefers to let her readers guide the discussion with questions. She was mostly asked about how she gets a novel finished, her work style (it involves a lot of Starbucks), and how she organizes all of her many characters (her most famous books are the Bridgerton books, eight siblings in Recency England, with eight different books chronicling their romantic mishaps). I had to get the fangirl picture. Promptly at 8:00, the event organizer signaled "last question" so Julia could start the signing line. I waited a good thirty minutes for my turn, but everyone was relaxed and happy so it didn't feel that long at all. Plus, I appreciated that she was taking time with each person, really talking to people and letting people take pictures with her. I asked the lady behind me if she'd be willing to snap a pic with my phone for me. My favorite author and I! When I got to the front of the line, the event organizer asked my name so she could tell Julia (who then asked how to spell it because she personalized her signing in my book). I told the organizer that I had driven all the way from Sacramento to meet Julia, and the organizer, in turn, said, "This is Megan. She came all the way from Sacramento tonight!" "Oh my God, really?!" Julia grew up near Santa Rosa and knows her California geography. She was so flattered I'd driven all that way. "When I saw this was your only event in Northern California, I just had to come!!" I told her, too, that I was making a weekend of it, going to the Schulz Museum, too. She had mentioned during the talking part of the evening that she loves flying into Santa Rosa because the airport logo features Snoopy. So all in all, it was a really great event--my first author event, actually--and I walked out of there really happy that I'd made the drive--it's about a hundred miles from Sacramento to Santa Rosa (not necessarily as the crow flies, just as the roads go). When I got back to my hotel, I parked in the designated lot, which just happens to be shared by a coffee shop that is catty-corner to Hotel La Rose. I had been hoping to chance upon some dessert and a hot beverage, and was delighted to find this shop stays open into the evening. I got a cookie and some hot chocolate, and sat down to enjoy some live jazz for a bit before heading back to my room. Peeking in at the lobby from outside. I woke up way too early this morning, as I always do in unfamiliar beds. After a shower and repacking my bag, I headed downstairs to take advantage of the continental breakfast. Nothing was remotely near open at 7:30 in the morning, and most of the Railroad Square area stays closed until 10:00, as does the Schulz Museum. I had a stroke of brilliance, however, and by 9:00 I was meandering into the Target at Coddingtown Mall to get a couple things I needed and had figured I'd get on the way home. Great old turning sign. The other side says Town. By 9:45, Sylvie was parked at the museum, and I had wandered across the street to The Warm Puppy for a cup of tea and a scone by the fire. It was just a bit overcast this morning, so this was perfect. our tea in Snoopy mugs. table reserved for him to this day, which makes me happy. Finally, it was 10:00 and I was off to the museum. 30 feet in height, I think. The art painted on the walls for this exhibit was perfection. As Snoopy envisioned himself soaring through the clouds in pursuit of his nemesis, the infamous Red Baron, he sat atop his doghouse, which he imagined to be a real British biplane known as a Sopwith Camel (Schulz once said, “Can you think of a funnier name for an airplane?”). He wandered through parts of Europe that World War I aviators genuinely traversed, stopping in cafés to quaff root beers and flirt with French lasses. In everything he cartooned, Schulz strove for authenticity, a point made especially clear by his Flying Ace storylines. The Flying Ace is my favorite Snoopy persona. Maybe because of my own connection to the Air Force? I don't know, but it's always made me happy. This was an animated projection on cloud cut-outs. Clever! Just outside of the Flying Ace exhibit...after I had giggled my way through the original strips there (some signed to people, "with love, Sparky" in his hand), I found the Best. Thing. Ever. The museum has set Lucy's Psychiatric Help booth (formerly outside), and some other large props like Snoopy's dog house and his supper dish, against backgrounds from the recent movie, and provided props. They encourage people to take all the pictures they want. You know I so did. Next, I wandered through another temporary exhibition, about Peanuts and football. There was more delighted giggling. Seriously, friends, Peanuts was a funny little strip. This is Charles Schulz pulling the football away from Bill Melendez, the late animator who voiced Snoopy and Woodstock. His voice, through archival footage, was used in the recent movie, and I love this so much. Shortly after I snapped the above picture, a little girl walked by me, yelling "AUUUUGH!" in Charlie Brown style. I burst out laughing--I love that a new generation is falling in love with Peanuts, even 15 years after the death of its creator. Who doesn't find this funny?! I wandered upstairs to see the permanent exhibits, but I didn't spend a lot of time there. Mostly I just wanted to pay my respects to the recreation of Schulz' studio, using his original drawing board, complete with the worn-down spot where he drew Peanuts strips for fifty years. Then it was back downstairs, where I asked a nice couple if they'd get a picture of me. Because I really, really, really needed to do this. Obviously. I stopped to tell the docent on ticket-taking duty that every time I leave this place, I have a huge smile on my face. He grinned at me and said, "Believe me, me too. It never gets old." I told him--a white-haired older gentleman--that I'm a life-long fan. "Oh, me too!" said he. I wandered over to the Snoopy Gallery and Gift Shop, and yes...I bought some stuff. Last year, I bought Belle and Spike dolls, with the intention of eventually rounding out the available dogs from Snoopy's siblings. Today I bought Marbles and Olaf, and probably would have bought Andy, but they were out. I'll get him another time, along with Snoopy in his little matching t-shirt. Then I'll have the whole set (as they haven't done dolls for Rover and Molly, sadly). So tonight, Marbles and Olaf are perched on my piano, making me grin foolishly. They'll look adorable in my classroom next year. I drove home through Wine Country, not stopping to take pictures, but just enjoying the stunning views as I meandered along. It's so nice to be in a position to have these little adventures from time to time.